Mountainaire Avian Rescue Society gives injured birds and other wildlife a second chance. what motivates them, and how they best learn. Imagine a school where the idea of a “classroom” is busted wide open—sure, kids sometimes sit at desks, but they also gather in small groups for teamwork, meet with community mentors, collaborate with kids on the other side of the globe, or do their math at home in their pajamas. Imagine a school aimed at preparing kids for the realities of the modern workplace, which continues to change at a dizzying pace. That teaches critical thinking so they can evaluate the tsunami of information that streams at them daily. That nurtures creativity and independent thought in all subjects. An increasing number of teachers and school administrators around the world have been doing just that—reimagining education in ways that border on the revolutionary. The result of this reimagining is a power-pack of ideas commonly referred to as 21st Century Education (or 21st Century Learning). This is an umbrella term that encompasses a variety of conceptual terms such as “individualized,” “project-based,” “inquiry-based,” “student-centred,” “personalized” and more. The Comox Valley’s School District 71 is stepping up to the leading edge in this education revolution, with two new programs that look unlike anything that has come before. The Fine Arts eCademy and the eCademy of New Technology, Engineering and Robotics (ENTER) will launch this September, delivered by Navigate, which is the new name of what used to be called North Island Distance Education Society (NIDES). The Fine Arts eCademy will be centred at the Navigate main campus at the old Tsolum School in North Courtenay. It’s a Kindergarten to Grade 9 program that meets provincial curriculum requirements while providing a special focus on theatre arts, visual arts, music and global education. ENTER will be based at Aspen Park Elementary and will offer a middle-years program for Grade 6 to 8 students who thrive while learning in a hands-on environment. The program is centred on explorations in engineering, science and robotics. Both of these programs will share the same unique structure, with three days per week of in-school learning, and two days of distributed learning (a new, more all-encompassing term for what has generally been called home-schooling or distance education). Both elements—the distributed learning (DL) and the in-school program—will reflect 21st Century learning philosophies. As is typical in revolutions, change appears to be happening fast. The new Navigate programs are springing into existence with great speed and energy—the very first meeting to discuss what was then merely an idea took place in February, 2011. Now, just over a year later, the programs are ready to launch. The Arts eCademy has more than 120 students registered—getting close to its maximum of 140—and ENTER has almost 20. Job descriptions have been written and teachers are lining up to be hired. The man at the heart of all this is Navigate’s Principal, Jeff Stewart. Stewart, a former principal of Courtenay Elementary and Lake Trail Middle/High School, took over as principal of what was then called NIDES in January, 2011. Back then, NIDES’ main purpose was administering distributed learning to approximately 4,000 students, ranging from part-time adults belatedly finishing high-school to home-learning kids from Kindergarten through Grade 12. This means providing students with paper or on-line materials, setting them up with a distance teacher (accessed by phone and internet), and hosting weekly “interaction days,” where students from around the Valley gather in the school for a day of traditionally-delivered education. When Stewart took the job, he knew he was stepping into something that needed a transfusion of energy and ideas. Full-time enrolment at NIDES was declining, even though DL numbers were increasing throughout the rest of BC. And the statistics from the School District as a whole weren’t entirely reassuring—the high school graduation rate in the Comox Valley stood at a lacklustre 72 per cent. “It was time to break the rule of five—the concept that school has to be five days a week. And it was time to break the boundaries of DL by doing something more blended… it was time to break the box,” Stewart adds emphatically, leaning back in his chair and pausing, allowing time for that declaration to fully resonate. Stewart is unflaggingly passionate in talking about the new programs. A solid presence in a crisply-pressed black shirt rolled up to the elbows, with a strong voice and a direct gaze, he floods his listener with facts, anecdotes, bold assertions and persuasive arguments about 21st Century Education and its particular manifestation at Navigate. Fuelling this potent enthusiasm is the new BC Education Plan. Unveiled in October, 2011, this simple eight-page document (www.bcedplan.ca) points out that the BC education system was designed 100 years ago. “The world has changed. The way we educate our children should, too,” the plan states. The plan repositions teachers as guides, mentors, coaches and content experts who work collaboratively with students. It says that the “core learning outcomes” in math, writing and reading will still be emphasized, while shifting the overall focus to promote self-reliance, problem-solving, innovation, teamwork, collaboration, cross-cultural understanding, technological understanding, and making connections with the world outside of school. This plan sets the foundation that has allowed these two new programs to happen. Also, Stewart credits the Comox Valley School District and especially the leadership of District Superintendent Sherry Elwood. Elwood, says Stewart, is one of a group of BC superintendents “leading the charge” to implement the approaches outlined in the BC Education Plan. “She’s absolutely embracing the 21st Century initiative and running with it. As a result, School District 71 is able to do some very out front things,” he says. This made it easier for him to move forward with his ideas. Wait a minute—a school Principal who’s promoting breaking (or at least “moving around”) the rules? Is this the public school system, or a music video for the gleefully rebellious Alice Cooper song, School’s Out? To help parents understand the essence of the new education, Stewart plays them a couple of videos of TED talks (both easily findable with a Google search). In one, psychologist Peter Bensen talks about “spark”—about how we can transform education by asking children what gets them excited, what gives their life meaning and purpose, what their spark is, and then letting that lead the educational path. Quoting Plutarch, he says that youth are not vessels to be filled, but rather fires to be lit. In the other, British educator Ken Robinson says, “Bring on the education revolution,” and calls for a shift in educational metaphors from the industrial model—based on linearity, conformity, and standardization—to a more organic model aimed at creating the conditions where kids’ natural talents can flourish. While the industrial model is about keeping things separate—things like ideas, disciplines, kids of different ages, the organic model is about making connections, and that is what the world needs. These statements get right to the heart of the education revolution—as well as dealing in facts and knowledge and skills acquisition, education must delve deeper, daring to ask how each individual student can contribute meaningfully to his or her world, and how their education can help them do this. “We have got to honor the absolute genius each child brings to this human party. Every child has something to bring, something powerful and unique, and our job as educators is to liberate that,” says Stewart. Although many elements of 21st Century Education trace back to the alternative education movements of the 1960s and 70s or even earlier—Summerhill, Waldorf, free schools, Montessori and more—the 21st Century has brought a key element that makes their realization on a mass scale much easier: modern communications technology. “The internet has links to hundreds of resources,” says Stewart. “Kids can find the ones that respond to their passions and learning styles. It totally blows away the “one textbook for the whole province” approach. Asked to imagine the school of the future—say, in 10 years—Stewart lights up. “You’ll see schools of choice proliferate. Students can choose schools with different themes and different ways of providing education. We’ll have a new breed of teachers who are artists of education rather than marathon runners. We’ll have full integration between school and community so the kids will be surrounded by adults who care for them. Every child will matter. Everyone will recognize that each child brings something valuable. And children will come out of schools turned on by life and by learning,” he says, barely pausing for breath between sentences. Clearly, imagining schools of the future ignites Stewart’s spark, to use some of his favorite 21st Century Education terminology. What makes that particularly interesting is that he is in a position to transform his imaginings into reality. Starting in September, the school of the future will be the school of the present for approximately 150 students who can expect, as a starting point, to be asked what ignites their spark. as a starting point, each child is asked what ignites their inner spark, what motivates them, and how they best learn. Students at NIDES work on a robotics project with teacher Roger Vernon. The new ENTER program, starting in September at Aspen Park Elementary, is centred on explorations in engineering, science and robotics, and will offer Grade 6 to 8 students a chance to learn in a hands-on environment. I am seated in the administration office and admitting centre at the Mountainaire Avian Rescue Society (MARS) when Reg Westcott walks into the room. He holds a great horned owl against his chest. Its feet— with long sharp talons—are held firmly but gently in his left hand. A towel is loosely draped over the bird’s head, so it wouldn’t struggle as it is moved from one building to the next. Maj Birch, the founder and manager at MARS, scurries over to get the latest update on the bird’s condition. The towel is slowly lifted off the owl’s head, revealing enormous yellow eyes set in a moon-shaped flat face. To me, the eyes simultaneously show both fear and trust. It is almost as if the owl knows that these people are trying to help him. Or, perhaps, he is just too weak to put up a fight. Up close, mottled brown feathers give the illusion of health but, I am told, beneath this feathery camouflage is an emaciated body. Without the efforts of the staff and volunteers at MARS, this owl would have died several days ago. With their intervention, food, medication, and plenty of TLC, there is hope that he will eventually be able to fly free again. After a few minutes of discussion about feeding and treatment options, the towel is once again draped over the owl’s head and Westcott, the Wildlife Centre’s rescue and education outreach worker, returns to the intensive care building. Maj Birch turns back to me and continues telling me about MARS—an organization that has built a solid reputation for providing rescue, rehabilitation and eventual release (for those with a chance for survival) for injured, ill, orphaned or oiled avian species. Everything from owls, eagles and blue herons to ducks, geese, Trumpeter swans and hummingbirds tiny enough to fit in the palm of your hand have received a second chance at MARS. Two of their more memorable cases over the years include a couple of pelicans. These clownish birds presented challenges and some comic relief during their stays, before they were well enough to be transported to a pelican sanctuary in the United States to complete their recovery. Then, there was a racing pigeon from Japan (easily identified by the band on his leg) that got way off course and wisely hitched a ride to dry land and safety on a Canadian Coast Guard ship. After a one-month quarantine at MARS, the wayward bird was transported back to his grateful owner in Japan. Birch is quick to remind me that MARS isn’t just a sanctuary for the birds! Although they do not have suitable facilities for long-term housing of most mammal species, MARS also provides short-term care and transport to other wildlife rehabilitations centres for orphaned, injured or ill native species, such as fawns, squirrels, raccoons and beavers. It is interesting to note that, due to the fragile and unique ecosystem on Vancouver Island, they are not permitted to rehabilitate non-native species, such as starlings, English sparrows, feral domesticated rabbits, skunks, foxes or opossum. There are, however, three full-time resident raptors that don’t seem to mind you looking at them. These birds were injured and brought to the centre years ago but were deemed unfit for release. 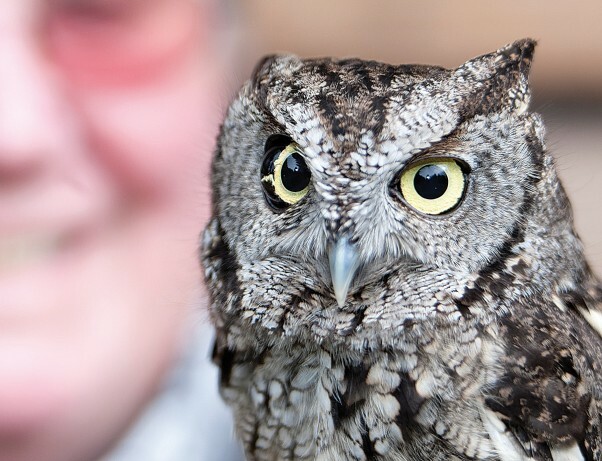 Shakespeare, a one-eyed barred owl, Horus, a hand-raised red-tailed hawk that had been abandoned and was unable to survive in the wild, and Otis, a little Western screech owl with one wonky eye, now serve as public education ambassadors. The MARS staff and volunteers and these three birds regularly visit local classrooms and appear at more than 50 meetings, lectures, displays, workshops, seminars and conferences every year. They are, perhaps, the most photographed birds on Vancouver Island! In 1992, Maj and her husband Keith moved to Vancouver Island and purchased a three-acre property at 6817 Headquarters Road, in Merville. One year later, they received the necessary wildlife permits to enable them to provide professional care for injured and ill birds on a case-by-case basis. They worked closely with the North Island Wildlife Recovery Centre in Errington, considering that they had limited facilities on their own property at that time. Otis, a Western screech owl rehabilitated by MARS, is one of three birds that now serve as public education ambassadors for the group. 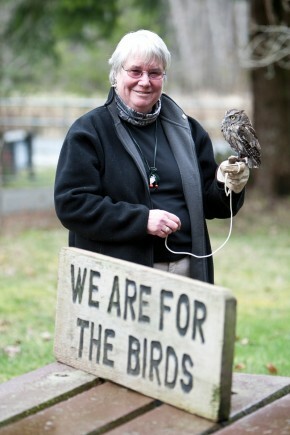 In 1995, the Mountainaire Avian Rescue Society became an official non-profit provincial organization. With the support of an all-volunteer team, the facilities grew along with the demand. Eventually, nine different buildings and flight pens would be constructed there. The old adage “if you build it… they will come” certainly rang true. An average of 20 ‘patients’ a year soon became 70, then 140. In the past couple of years, MARS has cared for about 450 cases annually. In total, several thousand creatures from the Gulf Islands, as far south as Nanaimo, east to Powell River, west to Tofino, and north to the top of Vancouver Island have been in their care. 2011 was a record year, with 54 bald eagles representing a large percentage of the caseload. While some perished, the majority were rehabilitated and released back into the wild. With the cooperation of various individuals and associations across the Island and on the mainland, MARS has a well-established network to assist with transportation of animals to and from the Wildlife Centre in Merville. Some volunteers transport wildlife by car. Others with boats provide water taxi service for the Gulf Islands. Pacific Coastal Airlines, Air Canada, Westjet and even a couple of pilots with privately owned small aircraft have all generously donated air transport on numerous occasions. Helicopter pilot Norm Snihur has been extraordinary in his support. Snihur has transported wildlife for MARS and other wildlife rehab centres for more than 10 years and personally logs about 300 hours annually. While demands on the Wildlife Centre continued to grow, Maj and Keith Birch were still working and helping tend to the birds before and after work. Although supported by a dedicated team of volunteers, the personal and financial stress, and tremendous time commitment, eventually became too much for everyone. For a brief period in 2000, MARS was forced to cease operations. During the ‘down time’ MARS supporters did not sit idle. They incorporated federally, to enable them to issue tax receipts to donors, and they developed a five-year business plan. The plan included hiring two full-time employees. Considering her extensive experience and dedication to MARS, the Board of Directors hired Birch as the manager. Sadly, Keith passed away in 2008, leaving the future of the entire project in Maj’s hands, along with the support of a dedicated Board of Directors and large volunteer base. While it would be fabulous to be able to fill this article with heart-warming or funny stories, and say that the financial concerns at MARS are a thing of the past, that isn’t the case. The truth is that the wildlife rescue centre that most Comox Valley residents are so proud of could use a little more TLC from the community. Ever-changing gaming grant regulations, ongoing funding challenges, and increasing costs put a strain on the 100 or so volunteers and two employees at MARS. Requests for public education presentations and appearances continue to grow, case loads increase annually, costs have risen dramatically, but funding has not grown to meet these demands on resources. Birch is quick to add that MARS is ever grateful for the generosity of many individuals and corporate donors in the past, and knows that they can be counted on for support in the future. Several large corporations, such as the TD Canada Trust Friends of the Environment Fund, Shell Environment Fund, and BC Hydro, to name a few, as well as the veterinary and the farming communities, local businesses, and artists, have all been extraordinary in their support. Also high on the MARS’ wish list is acquiring the land (and funding) to build and support the operation of a large flight pen to assist with the rehabilitation of bald eagles and other large birds of prey. My tour of MARS ends with a visit to a flight pen that contains four majestic bald eagles, all in various stages of recovery. They are startled when Birch and I first come near their enclosure and they swoop from one end to the other, not frantically, but definitely concerned with the sight and scent of a stranger coming near their territory. Their wing tips are only a metre or so from my face as they pass in front of me and, when they flap their wings, I feel a rush of air across my face. I also feel a flood of emotion and now understand how these birds have come to mean so much to Birch and others. I can only imagine the pride that the people at MARS must feel when one of these magnificent creatures blossoms under their care and can be released back into the wild—and they see their love take to the air. Hello Terri. I read the article you did in the April/May 2012 InFocus Magazine: “Love is in the Air”, about the Mountainaire Avian Rescue Society. You did a great job with the story and I’m sure this will give much needed financial support for this important organization. It’s really good to have also included the phone numbers for when someone encounters wildlife they think are in trouble. Thanks for your part in letting people know all about MARS – that’s a huge help for the birds and wild animals in need!